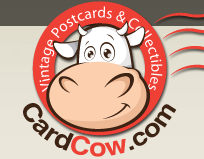 The History Museum at the Castle is located on the northwest corner of the intersection of East College Avenue and North Drew Street, at 300 East College Avenue, Appleton, Wisconsin 54911. 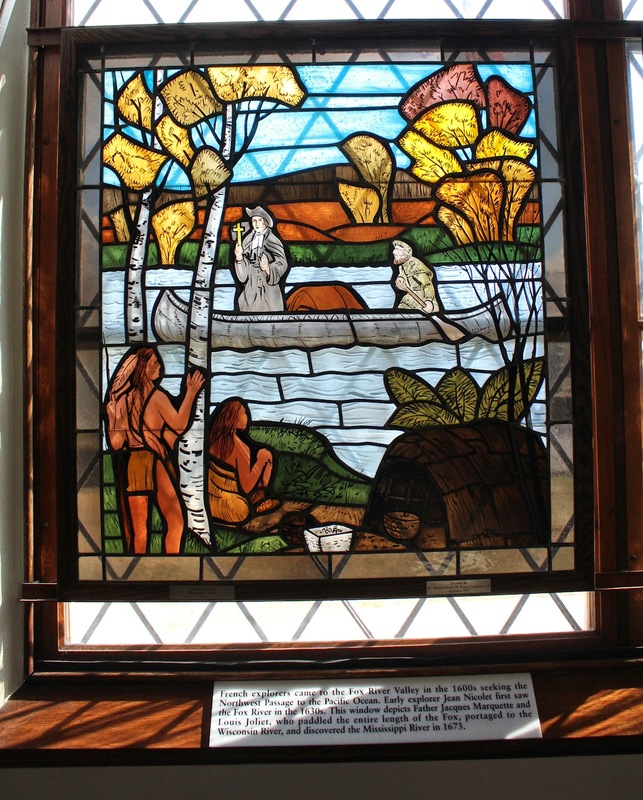 The beautiful stained glass windows below are located inside the History Museum at the Castle. The windows are displayed in four pairs. The photos show the window, a transcription of the marker beneath it, a close up of a section of the window, and a photo of the pair together. The history depicted begins with the arrival of French explorers in the 1600s and concludes with Hearthstone becoming the first house in the world lighted by hydroelectricity. French explorers came to the Fox River Valley in the 1600s seeking the Northwest Passage to the Pacific Ocean. 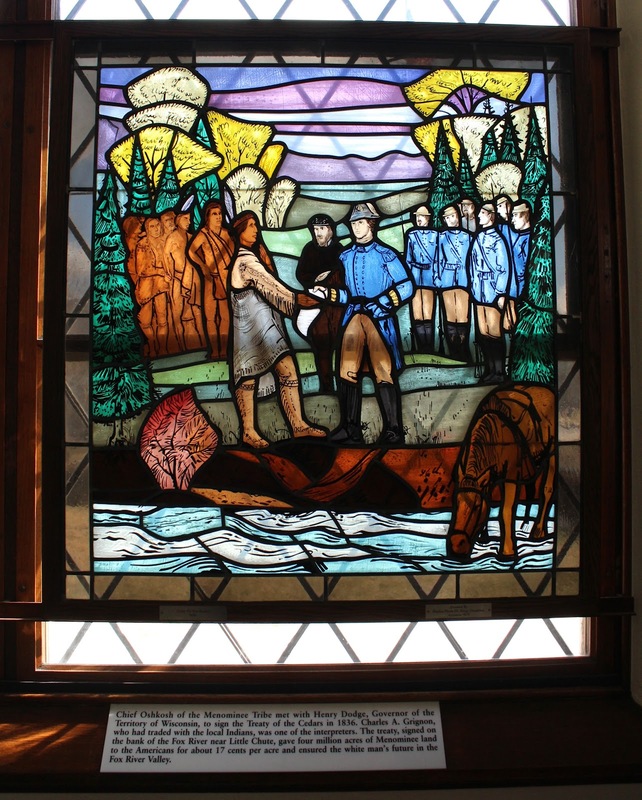 Early explorer Jean Nicolet first saw the Fox River in the 1630s. 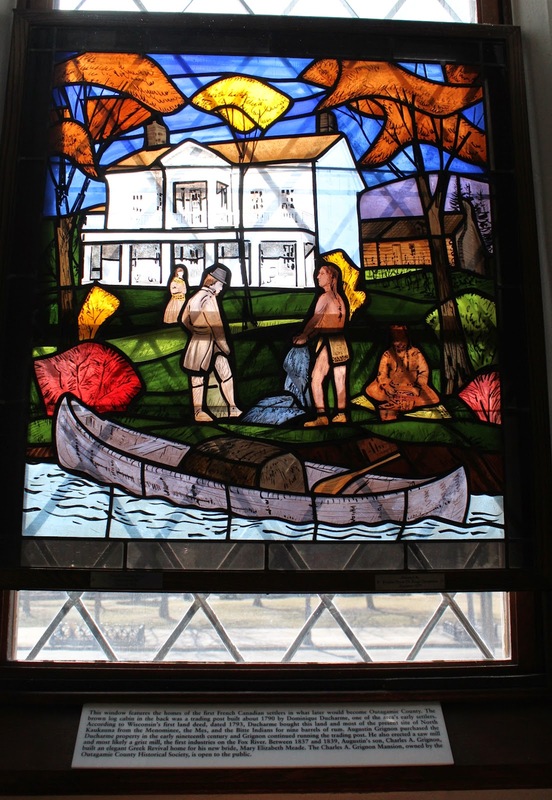 This window depicts Father Jacques Marquette and Louis Joliet, who paddled the entire length of the Fox, portaged to the Wisconsin River, and discovered the Mississippi River in 1673. Chief Oshkosh of the Menominee Tribe met with Henry Dodge, Governor of the Territory of Wisconsin, to sign the Treater of the Cedars in 1836. Charles A. Grignon, who had traded with the local Indians, was one of the interpreters. The treaty, signed on the bank of the Fox River near Little Chute, give four million acres of Menominee land to the Americans for about 17 cents per acre and ensured the white man's future in the Fox River Valley. 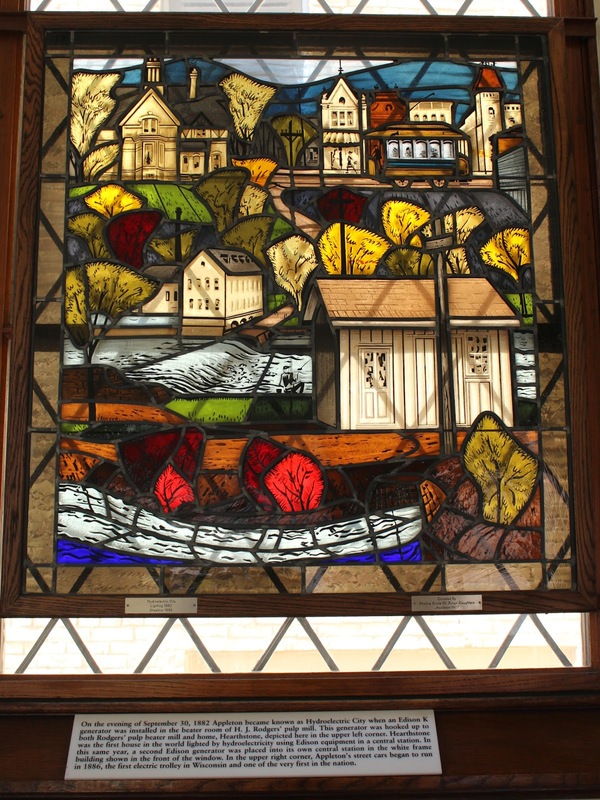 This window features the homes of the first French Canadian settlers in what later would become Outagamie County. The brown log cabin in the back was a trading post built about 1790 by Dominique Ducharme, one of the area's early settlers. According to Wisconsin's first land deed, dated 1793, Ducharme bought this land and most of the present site of North Kaukauna from the Menominee, the Mes, and the Bitte Indians for nine barrels of rum. Augustime Grignon purchased the Ducharme property in the early nineteenth century and Grignon continued running the trading post. 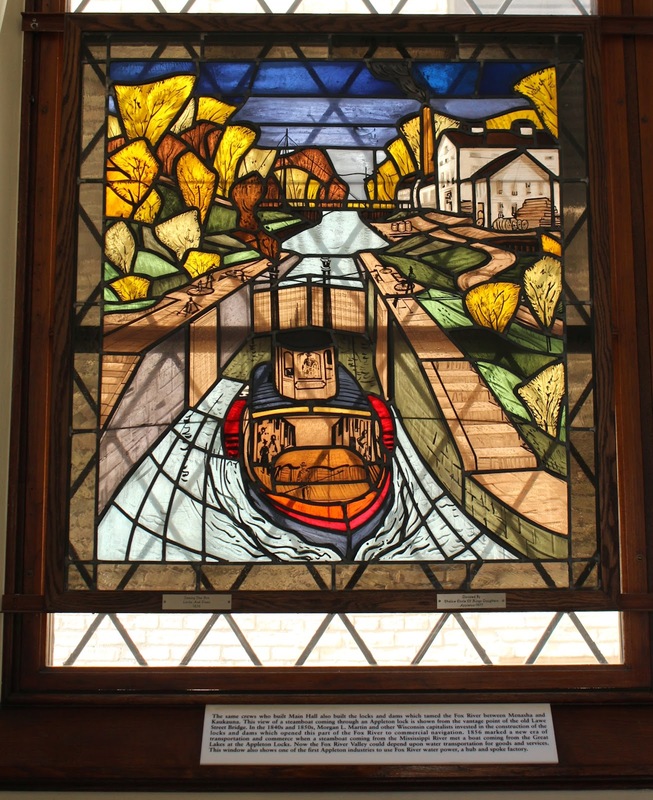 He also erected a saw mill and most likely a grist mill, the first industries on the Fox River. Between 1837 and 1839, Augustin's son, Charles A. Grignon, built an elegant Greek Rivival home for his new bride, Mary Elizabeth Meade. The Charles A. Grignon mansion, owned by the Outagamie County Historical Society, is open to the public. Religion played an important part in the lives of the Outagamie County pioneers. 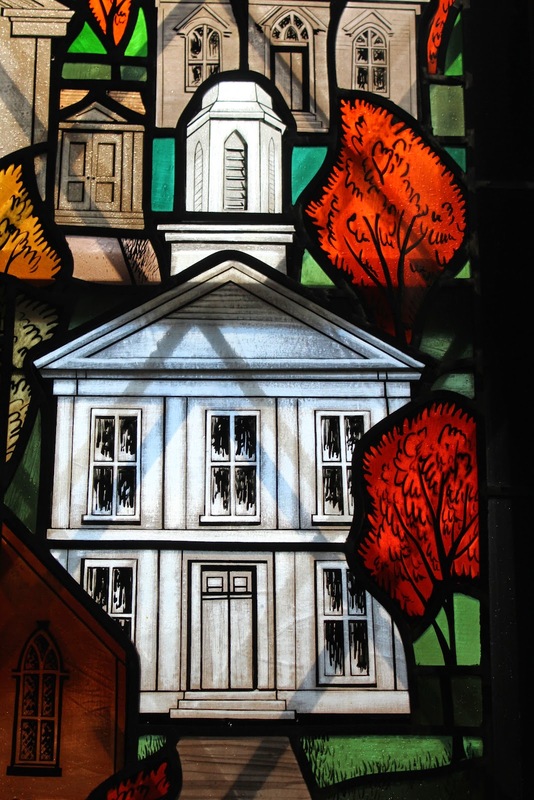 This window features the many denominations which located in the Fox River Valley. Built in 1828 in what is now South Kaukauna, the log cabin in the upper right represents the county's first missions, a Presbyterian Church begun by Reverend Jesse Minor for the Stockbridge Indians. 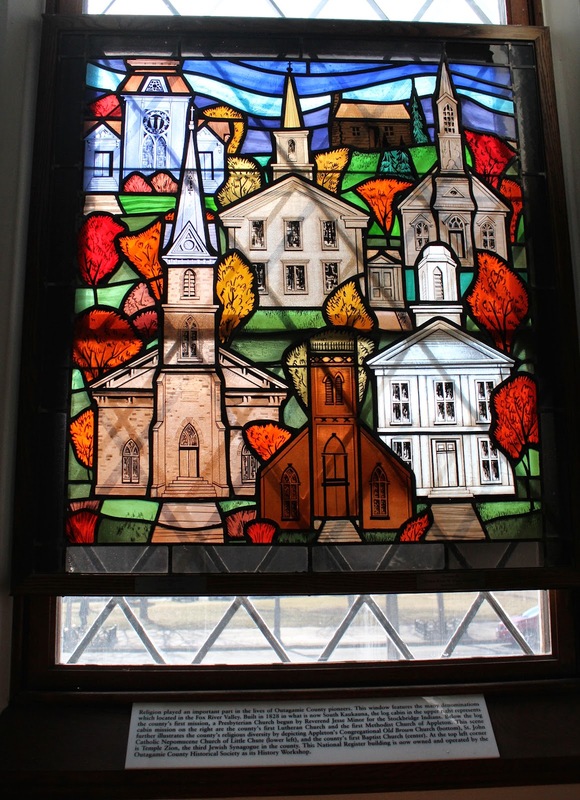 This scene further illustrates the county's religious diversity by depicting Appleton's Congregational Old Brown Church (bottom), St. John Catholic Nepomucene Church of Little Chute (lower left), and the county's first Baptist Church (center). At the top left corner is Temple Zion, the third Jewish Synagogue in the county. This National Register building is now owned and operated by the Outagamie County Historical Society as its History Workshop. The buildings of Outagamie County's many religious denominations. The city of Appleton grew up around Lawrence University. Built of river stone, Main Hall is the oldest and most impressive building on the Lawrence University campus. Chartered in 1847, Lawrence University moved into the newly completed Main Hall in 1853. Classrooms downstairs and living quarters upstairs accommodated both students and teachers. Main Hall is listed on the National Register of Historic Places. In 1853, the Richmond Brothers opened the first paper mill in the Valley. After fire destroyed their mill at the upper dam near the present Memorial Drive Bridge, they moved to the lower dam and built the mill pictured here, beginning the Fox Valley's longstanding worldwide reputation for its paper mills. This view looks northeast with the old John Street Bridge in the foreground. Across the river is the ravine which became Peabody Park. The same crews who built Main Hall also built the locks and dams which tamed the Fox River between Menasha and Kaukauna. The view of a steamboat coming through an Appleton lock is shown from the vantage point of the old Lawre Street Bridge. In the 1840s and 1850s, Morgan L. Martin and other Wisconsin capitalists invested in the construction of the locks and dams which opened this part of the Fox River to commercial navigation. 1856 marked a new era of transportation and commerce when a steamboat coming from the Mississippi River met a boat coming from the Great Lakes at the Appleton Locks. 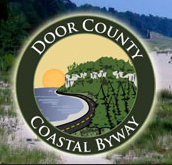 Now the Fox River Valley could depend upon water transportation for goods and services. 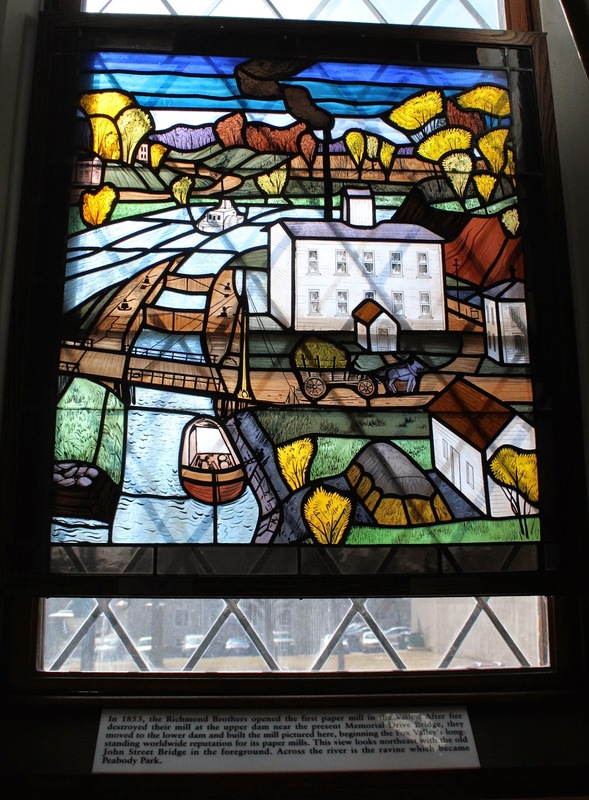 This window also shows one of the first Appleton industries to use Fox River water power, a hub and spoke factory. On the evening of September 30, 1882 Appleton became known as Hydroelectric City when an Edison K generator was installed in the beater room of H. J. Rogers' pulp mill. This generator was hooked up to both Rodgers' pulp beater mill and home, Hearthstone, depicted here in the upper left corner. Hearthstone was the first house in the world lighted by hydroelectricity using Edison equipment in a central station. In this same year, a second Edison generator was placed into its own central station in the white frame building shown in the front of the window. In the upper right corner, Appleton's street cars began to run in 1886, the first electric trolly in Wisconsin and one of the very first in the nation. This impressive edifice was originally Appleton's Masonic Temple. We visited on historic "Pi Day" -- 03.14.15 . . . 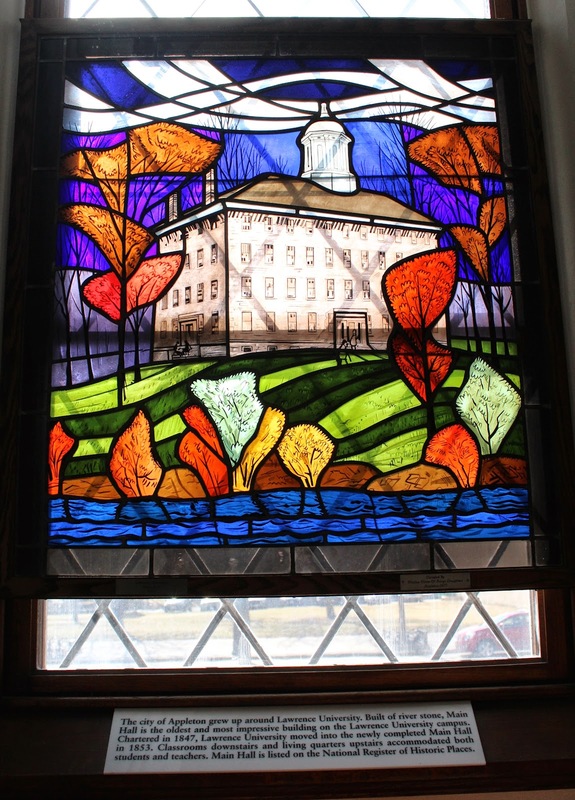 The stained glass windows are located inside the History Museum at the Castle.